On the planet Keska, a parochial war has returned to plague a peaceful civilisation after decades of tranquillity. But how can such a war have any connection with the great Time War? The War Doctor doesn’t believe so and he has a choice to make that will define this Doctor, and perhaps forever cast him in the role of ‘monster’. The War Doctor has, until this point in my mind at least, been a stand in for Christopher Eccleston. Created to serve as the Ninth Doctor’s replacement in The Day of The Doctor, The War Doctor never felt like a real incarnation of The Doctor. His whole purpose seemed to be that of a filler to make sure that The Day of The Doctor worked without Eccleston. Now however, The War Doctor has come into his own as a complex, different and satisfactory incarnation of the Time Lord. Following the “arc” story format of previous boxsets such as UNIT: Extinction, Only The Monstrous sees The War Doctor, having destroyed the Dalek Fleet forced to arrive on the planet Keska and be helped back to health by Rejoice, a native of the planet. Throughout the three linked stories there is a continual dialogue between The Doctor and Rejoice over whether he is a monster or not. The Doctor considers himself a monster because he has had to give up some of his principles and serves as a warrior rather than a healer. Rejoice claims that he isn’t a monster because though he is not healing in the conventional manner associated with a Doctor he is still helping. He is adapting himself to suit the conditions that surround him – fight or die. This is mirrored in the series by the inclusion of the Time Lord Seratrix. He is the opposite of The Doctor and attempts to find peace where The Doctor knows there can only be war. Ultimately, The Doctor is shown a brief amount of respite from his inner demons and comes to accept that in certain circumstances, taking a proactive rather than passive stance is the way to save lives. Alongside the main arc of The Doctor’s redemption we have his relationship with Rejoice. As this incarnation has not been seen with a companion, the inclusion of Rejoice shows a different side to his personality. He can be caring and has a sense of adventure like any other Doctor but he is tinged with regret. As is beautifully demonstrated at the end of Part One when The Doctor is forced by Rejoice to go into his TARDIS and states that she “wants to come with him” The Doctor says “Maybe in another time and place”. The regret and pain that comes through The Doctor is wonderfully played by Hurt and shows the way the war has changed him. Where once he would have gone on adventures with Rejoice, now he must stand and fight for the sake of all reality. 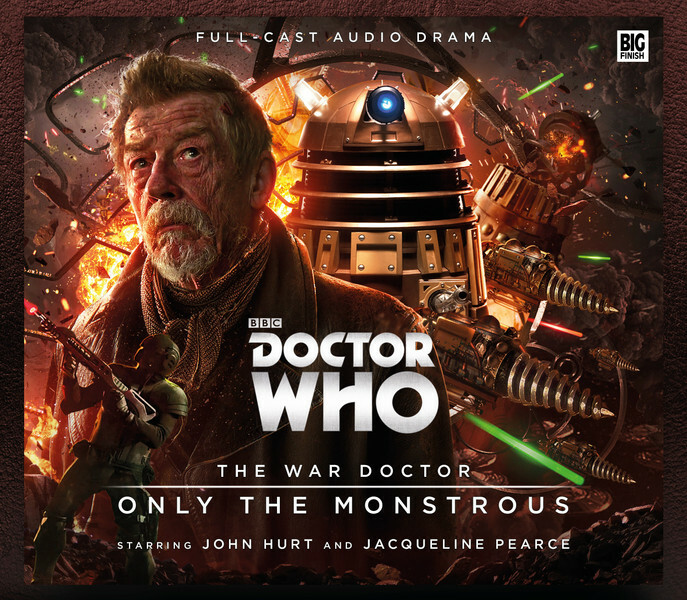 The acting in the series is fantastic with John Hurt as The War Doctor standing out. His inner turmoil is seen throughout the series, particularly relevant during his confrontations with Seratrix and Cardinal Ollistra. Lucy Briggs-Owen gives an equally mesmeric performance as Rejoice. Her interaction with Hurt is wonderful to listen to and they play off one another extremely well. Rejoice offers The War Doctor hope and Briggs-Owen emphasises that hope as only a skilled actor could do. Only The Monstrous proves two things. It proves that The War Doctor is not a monster but a man forced to work in ways that compromise some of his ethics. It also proves that he truly is The Doctor and an incarnation of The Doctor I’m looking forward to hearing more of. With thanks to Big Finish. You can purchase Only The Monstrous here.